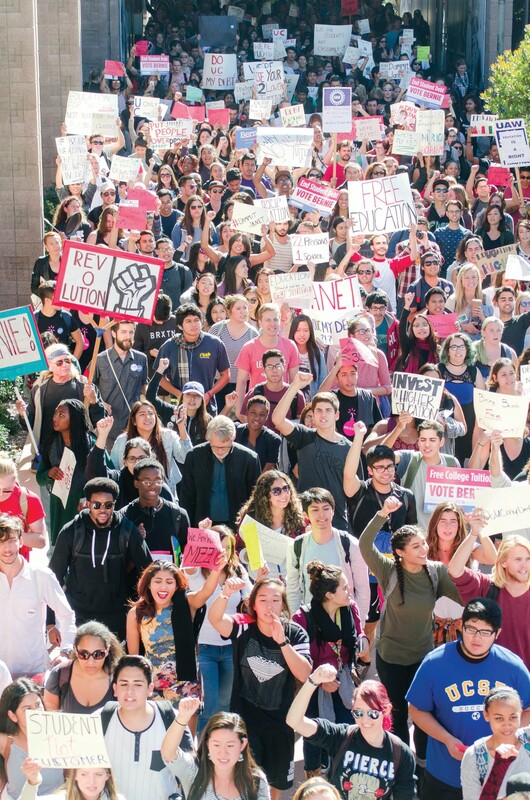 An estimated 1,500 students gathered at Storke Tower on Thurs., Nov. 12 as part of the nationwide Million Student March, which took place at over 110 campuses across the country. 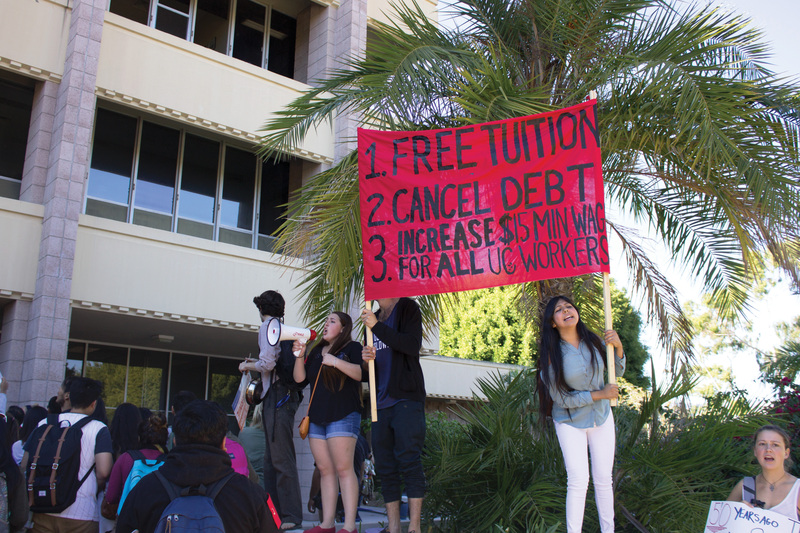 The three demands of the movement are to make public universities tuition-free, eliminate all student debt and establish a $15 per hour minimum wage for all campus workers. 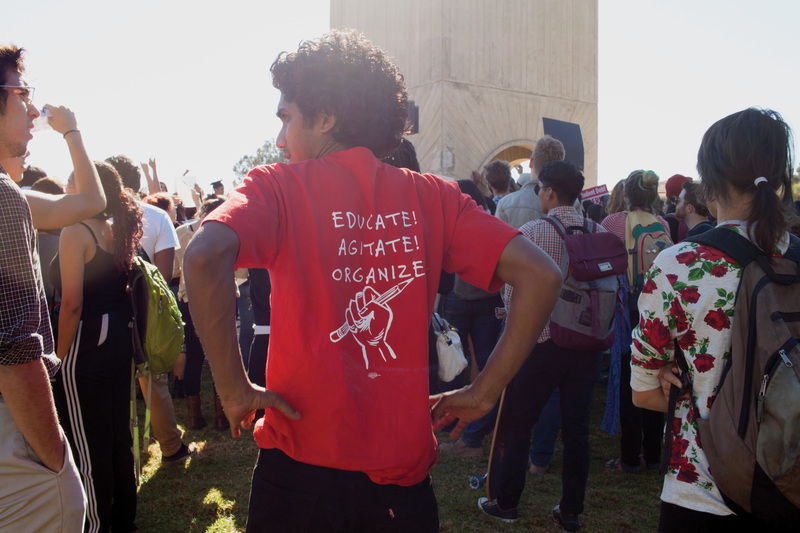 The rally began at noon as students walked out of class to join the organizers in Storke Plaza. The movement’s name comes from journalist Katie Couric’s interview of Democratic presidential candidate Sen. Bernie Sanders; when asked what his plans were to get reform through a “gridlocked” Congress, Sanders replied that it would take a million young people to march on Washington with awareness of their situation. At the University of California, Santa Barbara, a coalition of campus organizations including the United States Student Association (USSA), the University of California Student Association (UCSA), UCSB 4 Bernie, Pan-African Student Union, Associated Students Office of the External Vice President for Statewide Affairs (EVPSA) and Office of the Student Advocate (OSA) organized the march. Protesters called for systematic change from the University of California system, chanting slogans such as “UC, step off it, put people over profit” and “I’m fired up, can’t take it no more.” Various staff members joined them, including AS staff, who had been released at noon to join marchers. Many held posters showing the amount of their student debt from attending UCSB; other posters stated support for Sanders and “solidarity with Mizzou,” the University of Missouri campus where racial tensions have run high in recent weeks. Representatives from UCSB’s Black Student Union, AS, American Federation of State, County and Municipal Employees (AFSCME) 3299 and Graduate Student Association spoke at the rally. The protesters started at Storke Tower, and wound their way through the Arbor, North Hall — the site of 1968 Black Student Union protests — and Campbell Hall before ending their march at Cheadle Hall. There, students plastered a “Wall of Debt” on the windows of the building. Students taped papers saying how much they owed in loans — “30,000 TOO MUCH” “85,000 TOO MUCH”. In the weeks leading up to the march, students have taken to posting on social media, as well as placing boards and flyers around campus, to bring awareness to the cause. At Pardall Tunnel, bicyclists were greeted with a red-and-black board detailing the event time and location. On Tue., Nov. 4, organizers hosted a teach-in at the MultiCultural Center Theater to educate over 100 students and staff on the state of higher education and the three demands. Such work has been crucial in clearing up confusion about why these demands, like the minimum wage raise, are in place. Second year mathematics major Kyle Butts, who works alongside Houska as a general campus organizer in the EVPSA office, explained that the raise only applies to those who are hired directly through the UC and work at least 20 hours per week. Butts and Houska are hoping that the movement will become a topic of discussion at the upcoming Democratic primary debate on Sat., Nov. 14. All the organizers are hoping that the conversation does not simply end here, but rather continues not only on UCSB’s campus, but nationwide. 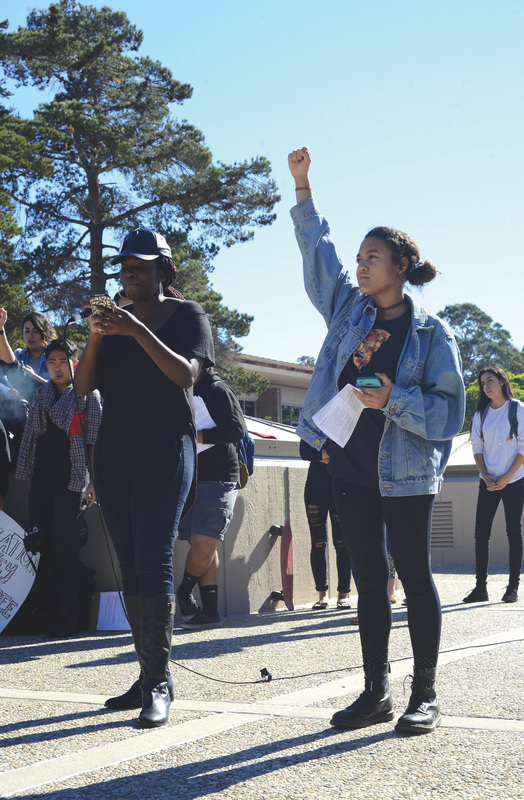 Given the success of student-worker movements historically, it is their hope that the march shows solidarity with student protests occurring globally in recent years and goes down as a moment in UCSB activist history. UCSB’s chancellor, Henry Yang, released a statement in support of the rally.